The current low participation rate of citizens with disabilities in the workforce is unacceptable. 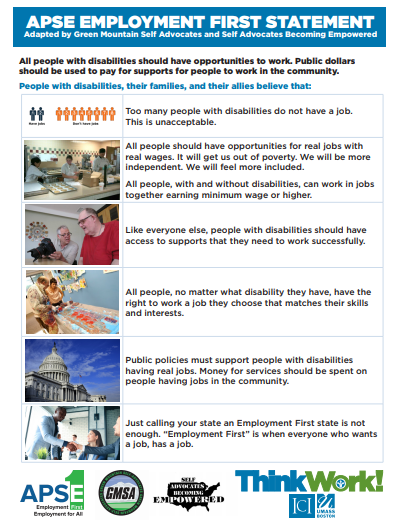 Access to “real jobs with real wages” is essential if citizens with disabilities are to avoid lives of poverty, dependence, and isolation. It is presumed that all working age adults and youths with disabilities can work in jobs fully integrated within the general workforce, working side-by-side with co-workers without disabilities, earning minimum wage or higher. As with all other individuals, employees with disabilities require assistance and support to ensure job success and should have access to those supports necessary to succeed in the workplace. All citizens, regardless of disability, have the right to pursue the full range of available employment opportunities, and to earn a living wage in a job of their choosing, based on their talents, skills, and interests. Implementation of Employment First principles must be based on clear public policies and practices that ensure employment of citizens with disabilities within the general workforce is the priority for public funding and service delivery. Inclusion or exclusion of the specific term “Employment First” does not determine whether a public system or agency has adopted Employment First principles. Such a determination can only be made in examining whether the underlying policies, procedures and infrastructure are designed for and ultimately result in increased integrated employment in the general workforce for citizens with disabilities. There are measurable increases in employment of citizens with disabilities within the general workforce, earning minimum wage or higher with benefits. Greater opportunities exist for citizens with disabilities to pursue self-employment and the development of microenterprises. 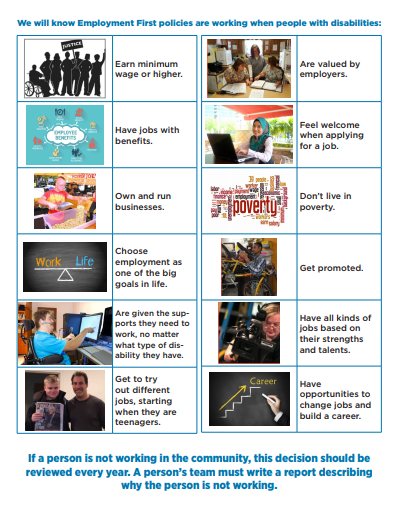 Employment is the first and preferred option when exploring goals and a life path for citizens with disabilities. Citizens with disabilities are employed within the general workforce, regardless of the severity of disability and assistance required. Young people with disabilities have work experiences that are typical of other teenagers and young adults. Employers universally value individuals with disabilities as an integral part of their workforce, and include people with disabilities within general recruitment and hiring efforts as standard practice. Individuals with disabilities have increased incomes, financial assets, and economic wealth. Citizens with disabilities have greater opportunities to advance in their careers, by taking full advantage of their individual strengths and talents. Funding is sufficient so that quality services and supports are available as needed for long-term employment success. A decision not to consider employment in the community for an individual is re-evaluated on a regular basis; the reasons and rationale for this decision are fully documented and addressed in service provision. Download the APSE Statement on Employment First. Download our statement on ending sub-minimum wage. Adopted by the APSE Executive Board on October 11, 2010.